I am running IIS 7 with .NetFramework 4.5 and have a SQL 2012 Server. I downloaded SmartStoreNet.Web.2.0.2.zip, unzipped it, and uploaded the contents to my IIS folder. When I attempt to access the site at www.whatevermysiteis.com I get a 404 forbidden access denied error. What is the first page I am supposed to browse to in order to set it up? What are the specific installation steps? 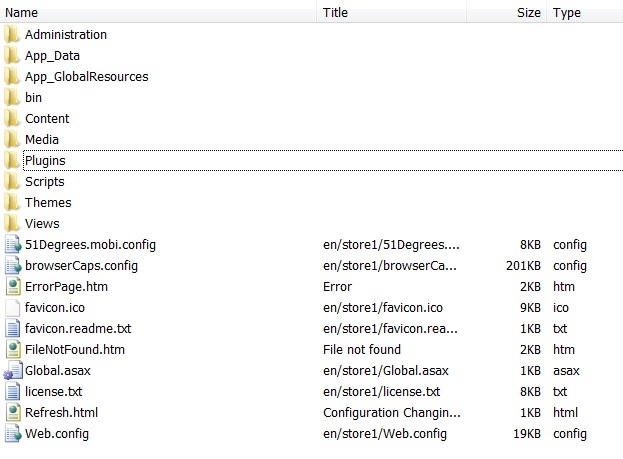 If I look at the contents of the IIS directory, it is shown below. There is no default.aspx or index.html page. What is the first page that I am supposed to access? I am thinking that is the root cause of this problem? If I manually enter www.whatevermysiteis.com/refresh.html I see the page which says "Smartstore.net is temporarily unavailable as a change in configuration requires a restart. A simple page refresh solves this issue." However, that is just the text of the refresh.html page so hitting refresh redisplays the same page. The only other pages in the root are error.html and filenotfound.html. What page am I supposed to browse to in order to start the setup of this? did you set the required permissions for the directories and files?